Stretching over 500 miles of wilderness, cutting through dense forest and plowing into thick snow, lies the Alaskan Railroad. 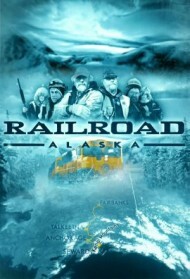 This October, Destination America makes a return trip through the Last Frontier with a second season of Railroad Alaska, chronicling everyday challenges faced by isolated homesteaders living along Alaska's critical railway. The series follows an elite crew who tirelessly work to keep the train rolling 365 days a year in order to deliver life-sustaining supplies to Americans living off the grid and miles away from civilization. With dedication, tenacity and a bit of grit, these Alaskans have truly mastered the splendor of living life on the track. Season 3, Episode 8 - "Meltdown"
Season 3, Episode 7 - "Trapped In Ice"
Season 3, Episode 6 - "Ice Rescue"
Season 3, Episode 5 - "Mountain Hell"
Season 3, Episode 4 - "The Dead Zone"
Season 3, Episode 3 - "Night From Hell"
Season 3, Episode 2 - "Eye of the Storm"
In the woods Jim and Nancy James challenge a wannabe off grid couple, and Jennifer Hawks tries to find a missing settler. Meanwhile, the freight struggles to deliver a heavy load. Season 3, Episode 1 - "Under Siege"
A quarter of a billion dollars' worth of military hardware is on board, but a rogue gunman threatens to derail the journey. Off grid, Nancy and Jim face challenges during an ambitious cabin build. Season 2, Episode 10 - "Train From Hell"
Season 2, Episode 9 - "Ice Attack"
Season 2, Episode 8 - "Earthquake"
Season 2, Episode 7 - "A Bridge Too Far"
Season 2, Episode 6 - "Ice Hell"
Season 2, Episode 5 - "The Big Freeze"
Season 2, Episode 4 - "Avalanche Hell"
Season 2, Episode 3 - "Collision Course"
Season 2, Episode 2 - "Mountain Danger"
Season 2, Episode 1 - "Bear Attack"
Season 1, Episode 6 - "Spring Attacks"
Season 1, Episode 5 - "Ice Dagger"
Season 1, Episode 4 - "Disaster Trail"
Season 1, Episode 3 - "Killer Ice"
Season 1, Episode 2 - "The Beast"
Season 1, Episode 1 - "Frozen Danger"